We haven’t had such a wonderful Sat for a long long time. We didn't have to time ourselves to wake up in time for a 10:30am tuition. We didn't have to time ourselves to have lunch to hit the 2:30pm tuition. We spent the morning is a rest and relax manner! Girl even have time to practise on her piano as we sang side by side with each other while daddy and son was trying to assemble a table. Great bonding time isn't it? Awesomeness! Just imagine “tuitionless” days! I didn't do this for my primary school going son FIVE years ago but 5 years later, I am in the same position as I loathed back then. I hated myself for loading my girl with endless tuition but as I don't know how to relate heuristic maths, analytical science, bombastic Chinese phrases or expressive English to my little girl. For her, I had to sub out every single subjects to others who had kept to pace with the crazy ever changing education system. Son also started having English tuition as his batch is now under the NEW English teaching system that they don’t even have assessment books for it. Well, I shall not complain so much or else our kids will not be resilient enough to face the challenges ahead. For our lunch today, I have chosen Jaime Oliver's Pizza. The dough is really soft and extremely easy to handle. With this weather, proofing was easy peasy. Like what they claimed, it is definitely a fantastic, reliable everyday pizza dough. Besides the poor shaping skill, I am sure even my 10 years old can handle it alone! Come join us for a relaxing Saturday. Sift the bread flour and salt together in your mixing bowl. In another bowl, mix yeast, sugar and olive oil together. Add in water and mixed briefly. Pour the liquid into the flour. Using a hook beater, bring the mixture together till a smooth dough formed. Put dough into an oiled bowl, cover with cling wrap and place it under a warm place. Proof till double in volume. Pour dough out into a floured worktop, punch out the gas. Divide into 8 portions. Let it rest for 10 min and shaped. Spread pizza sauce and assemble it with your favourite cheeses and toppings. Bake at 180 deg till cheeses turned golden brown. 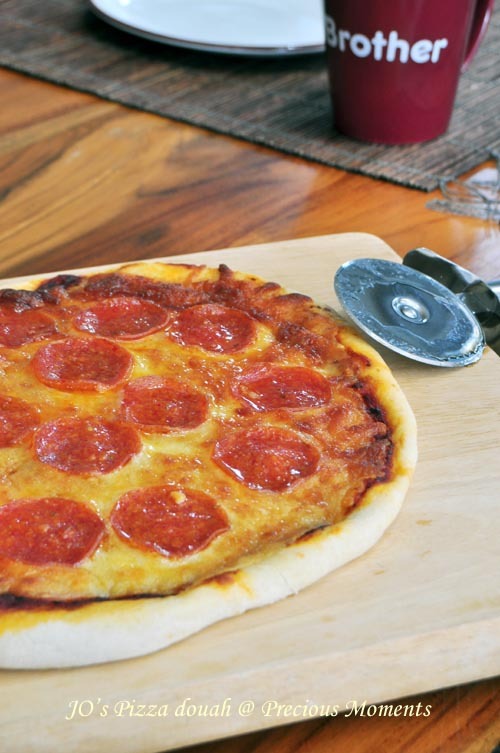 i've also tried this jo pizza recipe and i think the best thing is also we can freeze the dough to later use.